Growing Green: SUBURBIA FOR PEOPLE AND WILDLIFE TOO? HERE'S HOW. SUBURBIA FOR PEOPLE AND WILDLIFE TOO? HERE'S HOW. A short drive north and west of Portland, OR lies the Tualatin Valley, a flattish landscape with orchards, berry farms and Intel and NIKE headquarters. There's also the high speed MAXX transit line. The Valley is rimmed by wooded hills. Housing developments are under construction but are hemmed in by Oregon's progressive urban boundary law. There's more here than meets the eye. Side by side with suburbanite neighborhoods live multiple wild species, enabled by far-sighted water resource management and forested set-asides. I walk a lot in my neighborhood: my therapy goal is heart rate of 120 beats per minute. I log two or three miles of rapid-walk a day. This walking has brought me face to face with wild creatures: billions of crows and geese, one coyote, ducks, muskrats, bald eagles and white ospreys for example. Today's walk just east of home brought me face to face with two deer. Mind you, this was right in the neighborhood. 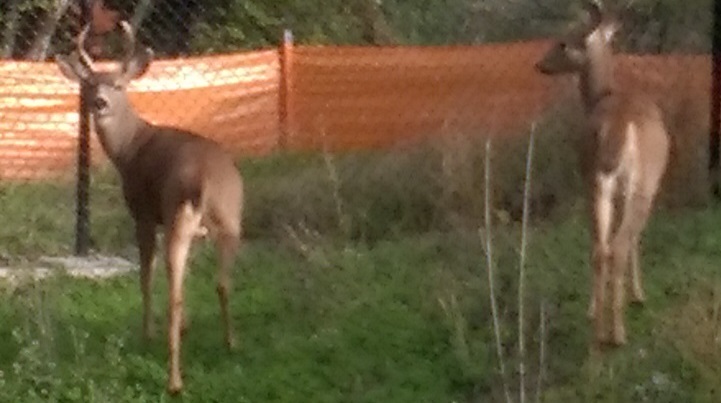 The first photo, just below, shows them grazing in a fenced lot. Eventually a house will be built here. In the upper left you might make out two poles of a power line. The power line and the sub-surface gas line beneath run from the wooded hills three miles north to end-users south of my viewpoint. The line hosts a walking-biking trail and lots of brush--perfect for deer that want to stay alive in their native territory. The deer were wary but not frightened. 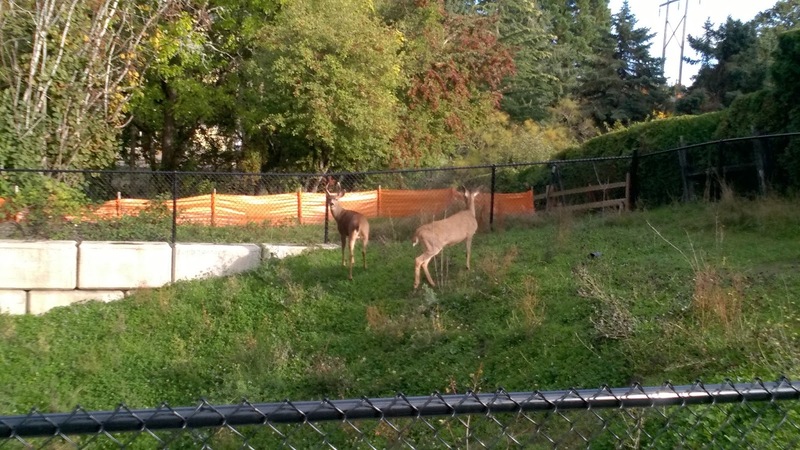 They calmly walked up to the fence while keeping an eye on me, fifty yards away with a phone-camera in my hand. A couple of photos later I left the deer to graze. Lucy and I have seen single bucks and a doe with the cutest fawns right in our part of town. Perhaps they're actually safer here than in the woods, where hunting is permitted in season. Back to birds. An Audubon member-friend told me that the suburbs will save the birds. Odd, I thought at the time, but I've changed my mind. Bronson Creek wetlands, located a block from my home, is hospitable to many species of birds. The nearby golf course, with its grassy fairway and pond, helps geese (by the billion, it seems) during winter, when golfers stay indoors. Tiny birds. 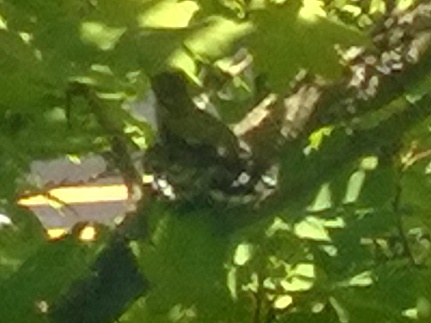 In 2016 a mother hummingbird raised her brood in a vine maple tree within sight of our bedroom. It's not all "nice." Walking down a paved neighborhood street, I saw a dog-like creature, taught and tense, stand on the pavement, gaze, sniff the air. Between me and the animal a woman was walking her pet dog downhill in the direction of the critter. She saw the critter too and immediately reversed direction. We both recognized that we'd seen a coyote, during daylight hours, right in the neighborhood. The coyote soon headed straight toward Bronson Creek wetland. After, I imagined, a meal of dog-food left out on a neighborhood porch. I'm not, I hope, being naive. I just think that with appropriate land use, including ribbons of set-aside for creeks, ponds, and pathways, animals and birds can enjoy their lives and grace our lives. Could this sort of Green land planning occur in New York City, Austin, Los Angeles, Seattle, Berlin, Cairo, Capetown? It could and does. It could be enhanced by greater public pressure, leading to more pro-active policies. I hope that legislators will keep the birds and animals in mind as they develop zoning plans. Land-use planners too. Maybe you'll help them by communicating your desire to share your suburbia with birds and animals.